Throughout your search for a junk car buyer, you will find a lot of information on the money they will give, how easy it is, any incentives they may offer but you won’t find much information on the actual process, save for a sentence tossed in hoping you may not actually read it, well the more unscrupulous ones anyway. At My Junk Car Buyer we believe that you should head into any process informed, which is why we outline here the process of junking your car. Firstly, as with any situation you head into, having information is invaluable, and when you contact any junk car buyer, you need to know the basics when it comes to your vehicle. The first and most important being, any car still has value. Some companies will stoop low enough to tell you that your car has no value, and they will gladly take it off your hands. Your vehicle still has value, and no matter the state, talking to the pros at My Junk Car Buyer will bring you this information in an easy and honest way to understand. The second step of course in our process is for you to head on over to www.myjunkcarbuyer.com to find out more about the basic value of your vehicle, the services we provide in the transaction, and what you need to do as part of the process. We aim to outline everything in clear and concise terms to ensure that you are fully informed, and that you feel comfortable with the process. We aim to give you hard figures before any transactions are made to give you peace of mind throughout the process. 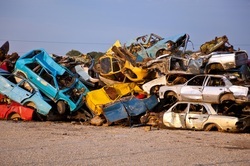 Though we try to bring you as accurate a figure as possible on www.myjunkcarbuyer.com, it would be extremely difficult to be 100% accurate, as every vehicle is different, and every salvage complicated in their own ways. This is why for the third step we bring you the means to have a professional on site to fully asses your vehicle, and to compile the value based on what can be salvaged. Every vehicle has it’s own value, and in order to bring you an accurate representation for your vehicle, we need to know all the factors much like you do in selling. The final step of course is for you to get paid for your vehicle, and us to haul it away. Before making any transaction we ensure that titles are properly signed over, and that steps are taken to legally accommodate those who don’t have their vehicle title. One key difference between our service and others is that we ensure that the check is in your hand before we make any movement on your vehicle. We want the process to be easy, to have you feeling accommodate, and for you to have the feeling that you made the right choice in contacting My Junk Car Buyer.